In 1860 four Dominican sisters came to Nashville, Tennessee at the invitation of Bishop James Whelan, O.P. to begin a new foundation. 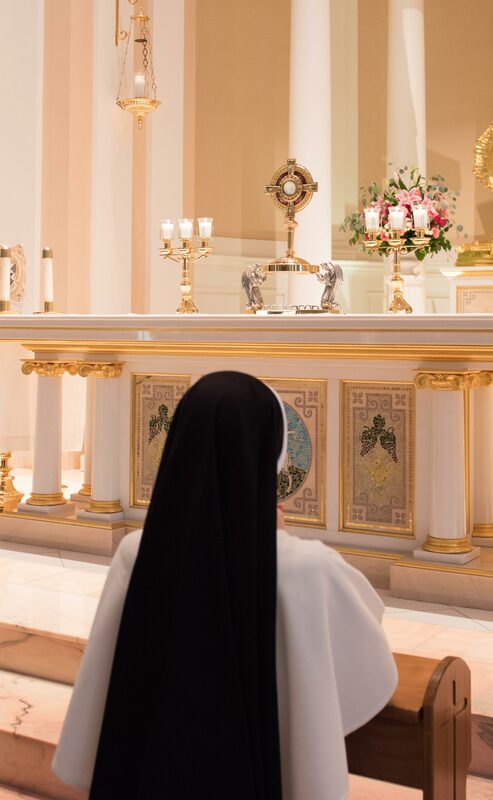 For over 150 years, the Dominican Sisters of St. Cecilia have continued to serve the Church through their religious life and their educational apostolate. They seek to offer public witness to Christ’s presence in the world, through their life lived in community; daily prayer in common and centered in the celebration of the sacred liturgy; and wearing of the Dominican habit. Since the arrival of the four sisters in 1860, the Congregation has expanded its apostolate to 33 schools located in the United States, including the Congregation’s own college in Nashville. The sisters are also present in 10 schools located in Rome and Bracciano, Italy; Sydney, Australia; Vancouver, Canada; the Diocese of Aberdeen, Scotland; Diocese of Roermond in The Netherlands and the Diocese of Limerick, Ireland. Through its educational apostolate, the community seeks to bring Christ to children and young adults, whether in suburban or inner city schools, private institutions or diocesan. Drawn by the desire to give their lives totally to God in fidelity to the Church, the sisters above all wish to help others know, love and live for Jesus Christ. The community has continued to experience God’s blessing of new vocations. This past summer, five young sisters professed perpetual vows, with 13 others making first profession. Twelve received the Dominican habit. With the entrance of 15 postulants in August, approximately 50 sisters are presently in the initial four years of formation. The Congregation now totals nearly 300 sisters, the largest number in its history. With this gift also comes the challenge of providing for the needs of a growing community. Through the generous annual support of benefactors, the sisters are able to provide for material needs that are not met by regular income from their teaching stipends. With grateful hearts, they offer benefactors the support of their prayers. You can assist the Dominican Sisters by making a financial gift to support their life and mission. Your gift will be used for daily living expenses not covered by the sisters’ teaching stipends. These expenses also include education and formation of the sisters; health care; maintenance of their Motherhouse, Bethany Retreat House, and a House of Studies; and building endowments for the future. If you have any questions or need assistance, you may contact our Advancement Office by phone (615.251.0053), fax (615.259.0176), email (diradvance@op-tn.org) or mailing address: Dominican Sisters of St. Cecilia, Advancement Office, 801 Dominican Drive, Nashville, TN 37228.